Educating Nanaimo gives visitors a feeling of what it would be like inside of a mid-1920s school room. 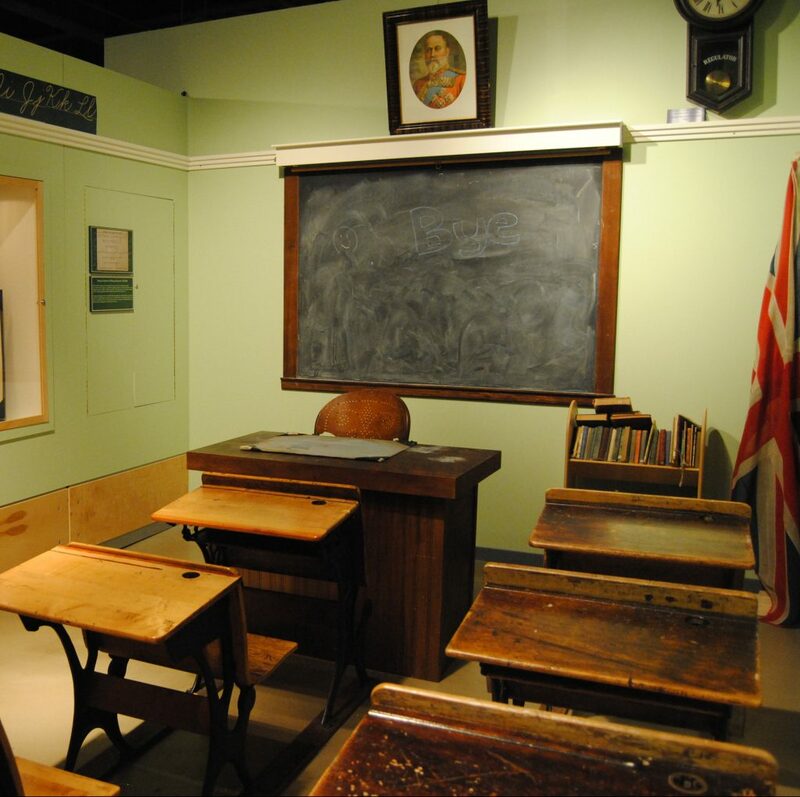 This classroom features many elements of an early Nanaimo school room, such as the type of desks and implements used for delivering lessons. Of the learning techniques used, the MacLean Method of Writing is presented. It is a system of handwriting developed, circa 1921, by Victoria educator H.B. MacLean. Also featured is a timeline of vocational schooling in Nanaimo. Early School Experiences of Nanaimo Resident, John Cass – John was born in Nanaimo on September 22, 1921. He remembers some of his early school days in three particular Nanaimo schools – South Ward, North Ward, and Middle Ward. He first started attending Middle Ward School in 1929-1930, which was located between Nicol St. and Victoria Rd., there wasn’t much of a playground for fun and games. Marbles was the most exciting one to play – in fact John still recalls all the times he lost his marbles – while the girls occupied their time with a lot of skipping. Kids were not allowed to play with bats and balls in Middle Ward neighborhood for the fear that they may break all of the windows. The school that John attended had four classrooms and four teachers.